Audiovox announced the industry's first automotive in-dash Blu-ray Disc player that plays any Blu-ray Discs as well as traditional DVDs and CD Audio Discs. The AVDBR1 head unit is installed under the seat or in a storage compartment in the vehicle and connects to any monitor by using either the HDMI, composite or component output. The AVDBR1 has been road tested to tolerate the vehicle's environment and its small size allows for multiple horizontal and vertical mounting options in the vehicle. A blue accent light is used to illuminate the slot load disc area and button array. The unit is powered from a 2-pin, 12-volt connector to the vehicle's accessory power source and comes with a full function wireless IR remote control. An 18 foot long IR extension is also included to allow for operation of the system via remote control, while the unit is concealed, under a seat, storage compartment, trunk, or cargo area. The infrared sensor will accept the IR commands from a remote and relay it back to the unit. Note: WiFi capable — for wireless media streaming (firmware upgrade available 2011). 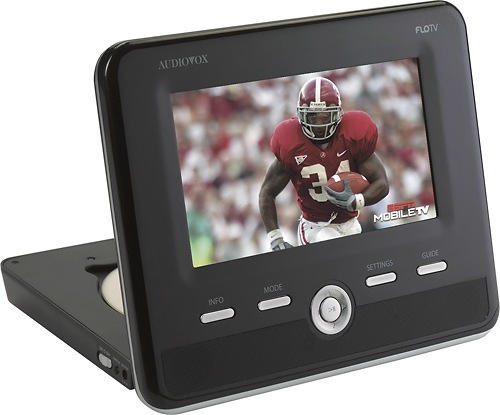 The Audiovox AVDBR1 In-Dash Car Blu-ray Player will be available in the spring of 2011 for $349.99.